The Joint POW/MIA Accounting Command wants to take the unprecedented step of exhuming all of the Dec. 7, 1941, casualties of the USS Oklahoma buried as "unknowns" at Punchbowl cemetery — more than 330 crew members — to help it reach a higher number of annual identifications mandated by Congress. 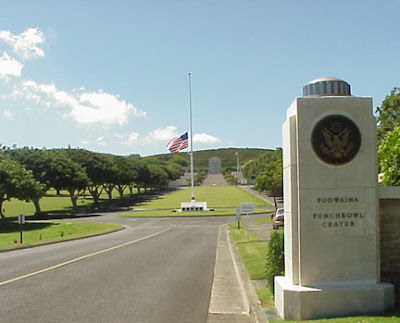 But the Hawaii-based military command, known as JPAC, is getting resistance from the Navy, which prefers to maintain the "sanctity" of the graves at the National Memorial Cemetery of the Pacific, officials said. Star-Advertiser. After one of its best first quarters ever, Hawaii's hot hotel industry cooled off some in the second quarter, allowing New York to reclaim the distinction of having the nation's costliest nightly hotel rate. Star-Advertiser. Oahu Democrats on Saturday moved to temper an intraparty fight over traditional marriage and focus on persuading Gov. Neil Abercrombie and the state Legislature to return in special session to consider marriage equality. Star-Advertiser. The fight in Congress over eliminating sugar subsidies has been good to members from Hawaii. The delegation has raked in tens of thousands of dollars in the past couple years as the U.S. sugar industry spends millions to convince Congress that it needs help in order to compete with foreign producers. Civil Beat. Hawaii struggles to keep new teachers. Associated Press. Top U.S. Navy commanders in the Asia-Pacific region have formed a task force to discuss sexual assault issues as the branch fights to stem a military-wide problem within its ranks. Associated Press. The Hawaii State Judiciary is warning the public to be on the alert for an apparent telephone scam by a person claiming to be a court employee. Associated Press. State roundup for August 12. Associated Press. Heading into Thursday's hearing before the U.S. 9th Circuit Court of Appeals, proponents and opponents of the city's $5.3 billion rail system expressed confidence in their positions. Hawaii News Now. The multi-billion dollar Honolulu rail project was only minimally stunned by the U.S. District Court for the District of Hawaii for its failure to adequately study the project’s possible effects on Chinatown and Mother Waldron Park (an old urban park/playground), and for its failure to articulate the reasons why a tunnel under Beretania Street (a major city arterial) was rejected. But bumpy track still looms ahead. Hawaii Reporter. A proposal to give the City Council more power over the Honolulu Board of Water Supply remains alive, but the board has gained some breathing room. Star-Advertiser. Trying not to smell the stench from the Ala Wai is becoming a challenge. Residents say ever since the city began working on removing the temporary sewer pipe from the canal the smell is almost too much to bear. KITV4. Teenage Girl to State: Clean Up the Ala Wai and Comply With Law. Civil Beat. Where there once was a flat and empty rooftop, there now grows a garden. The 4,400-square-foot garden atop the Institute for Human Services' service center on Kaaahi Street is expected to provide healthy meals, training opportunities and an escape from the industrial setting of Iwilei. Star-Advertiser. When it comes to recycling…Hawaii has struggled with a lack of resources and funding. But a new hands-on project in Oahu is taking a do-it-yourself approach. Hawaii Public Radio. The Hawaii Island Food Basket had to throw out more than 19,000 pounds of food — almost 10 tons — because it couldn’t distribute it fast enough after the County Council declared a food emergency and gave it $275,000 last year. That’s according to a report the Food Basket sent Monday to Council Chairman J Yoshimoto after a West Hawaii Today investigation revealed the nonprofit had not met the reporting requirements in the May 3, 2012, contract where the council took the unprecedented step of dipping into the county disaster fund for the money. A series of amendments that would ban scuba spearfishing and limit aquarium fish collecting in West Hawaii waters is set to go to Gov. Neil Abercrombie next week, Department of Land and Natural Resources Chairman William Aila said Friday. West Hawaii Today. A University of Hawaii research program that involved six people living in a Mars-like habitat on the slopes of Mauna Loa volcano is about to come to an end after four months. The press is invited to a media conference later this week with the researchers who have been living in the habitat and emerging only in space suits. Civil Beat. The fast-growing albizia trees, an invasive species, have earned a reputation in Hawaii as “junk trees,” due to their propensity for spreading and growing like weeds and posing a danger to people, power lines, vehicles and homes due to their brittle nature and tendency to collapse. Tribune-Herald. The Hawaii Supreme Court ruled Thursday that the Maui County Council violated the state open meetings "Sunshine Law" in approving a Wai­lea development, but declined to invalidate the county's approval for the residential community. The court instead sent the case back to Maui Circuit Court to determine the amount of attorney fees for the five residents who filed the lawsuit contending the law was violated. Star-Advertiser. The plaintiffs in a "Sunshine Law" challenge to the Maui County Council's approval of the Honua'ula project in 2008 claimed victory Friday in a ruling on the case Thursday by the Hawaii Supreme Court. Maui News. The third of four wells that aim to space out pumping on the south side of the Iao aquifer to help protect the main water source for Central and South Maui could go out to bid soon and possibly be operational in a year, said the deputy director of the Department of Water Supply on Thursday. Maui News. Native Hawaiian community and Maui labor leader Perry Artates resigned last week from his post as a Hawaiian Homes Commission member after pleading guilty to federal wire fraud and false loan application charges in June, according to state officials and federal court documents. Maui News. Intermediate Court Ruling Could Lead to Substantial Cash Settlement for Victims of Ka Loko Dam Breach. Hawaii Reporter. The Department of Land and Natural Resources, Division of Boating and Ocean Recreation is holding a public information meeting next week to discuss the upcoming Kikiaola Small Boat Harbor Sand Bypass System and Breakwater root repair projects. Garden Island. Kauai County officials say vandalism is the reason behind a decision to close a popular beach park at night. Starting Monday, Hanamaulu Beach Park will be closed from 10 p.m. until 6 a.m. Associated Press. Kauai County Mayor Bernard Carvalho, Jr. says he plans to select a site for a proposed residential adolescent drug treatment center by the end of the year. Garden Island. The Kauai County Council’s Finance Committee deferred for two weeks a proposal that represents the last stage of a three-year property tax reform to address inequities and create a fair system going forward. Garden Island. The blessing of its new emergency room and diagnostic lab Friday may be just the beginning of Lanai Community Hospital's efforts to further satisfy the health care needs of island residents and the plans of billionaire Larry Ellison's Pulama Lana'i. Maui News.